primarily of a foam wreath form and fur yarn. Pinterest trying to steal someone else's work and idea? Patty Schaffer's Spring Baby Grass Wreath. 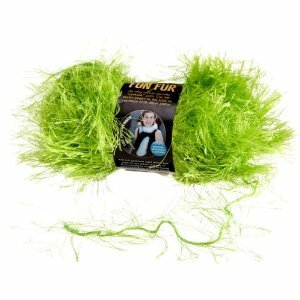 ...and lime green fun fur (or eyelash) yarn. of the eyelash yarn to cover it. At first I could not find this color and tried to dye some white and other colors fun fur/eyelash yarn. Do not attempt. The yarn is polyester and did not take up any dye. I finally did find some locally but if you can't, you might need to order online. Get the larger skein (55 yards I think). It will be about $7 - $10. Did I accidentally copy them to an obscure file? Did I forget to have to memory card in the camera? keeping the strands of yarn close together. This is a re-creation of how to wrap the wreath with some of the non-dyeable fun fur yarn. All the lime green yarn got used on the original wreath. It is so darn cute and fluffy...you just want to "pet" it. occasions just by changing out the decorations. can be used outside. If it gets wet, you may need to "fluff"
the fur yarn with your fingers to perk it up. The wreath form was $8, the yarn was $7, and the eggs were $7 if all are regular price. If you look for sales or use coupons at the craft stores, it would be less. in my driveway. It just looked kind of "meh" from the street. instead of having them march "single file" around the wreath. I wasn't happy with any single ribbon that I found. was not wide enough so I combined the two ribbon in the bow. I was shopping for the ribbon. should I even them up? close AND at a distance. has gone wrong with it (including posting the above photo that is crooked). I'm glad all blog posts are not this difficult or I would have given up already. I hope you will make one too! I love it! What a fabulous idea, I can see it as a Christmas wreath, too. so terrible that people are stealing via pinterest like that! very cute, stopping by from centsational girl's link! I seriously thought that you somehow did that with real grass until I scrolled down and saw that it was yarn! The texture and color matches the real grass that I planted perfectly! Wouldn't those things be cute paired together? Nice job, it turned out great! This is so fun. It looks like real grass. You find the best ideas. Love a good copy cat! That wreath is so cute! It looks like a fuzzy chick! Okay, at first I didn't understand the green fur, but now I do. How adorable that it looks like Easter basket grass. That is darling!! What a brilliant idea for Easter. It is fuzzy wuzzy and adorable! I just love your wreath. Such a clever idea to use that type of yarn. Perfect. Thanks for sharing at DIYbyDesign. That is so cute! I love what you did with the "fur"! You are very good to go out and find the correct link to the original post. Lots of people don't do that! You are a very sweet blogger! Thanks for sharing this at my party this week! I hope you will share this starting tonight at The CSI Project, The challenge is Spring Vignettes and Decor. That includes Easter. It will be a great party!!! Lots of inspiration. Congratulations on your 100th blog post! Lovely entryway -- the wreath is adorable. Your wreath turned out really pretty! Congrats on the 100th post! Thanks for sharing at the Rock 'N Share. What a great wreath! Love the colors...so bright and festive, just in time for Easter! Such a cute idea, and looks a bit like moss. This would be so cute in other colors for different holidays. Thanks for sharing. What a cute idea! I love your final product. The changes you made are perfect. And I like the ribbon tails different lengths! This is the cutest wreath! I love the look of the yarn and the Easter eggs...so adorable. Thanks for linking to the Open House party. Turned out beautiful and I like your urns as well. Have a great day. This is such a cute wreath! Thanks so much for sharing it with us this week! We featured it today! 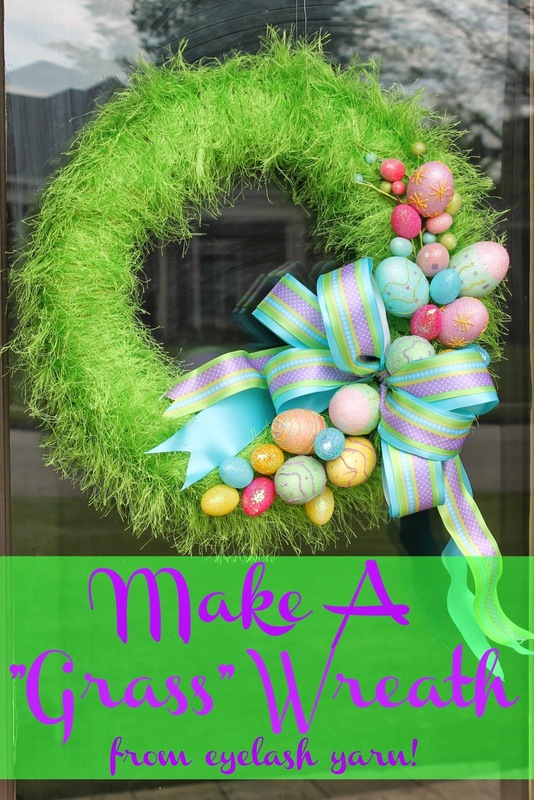 This is just the cutest Easter wreath ever! You did an amazing job! A beautiful wreath. I love the ribbons you chose. Love this idea! You did a great job! Love your wreath! So pretty with all the easter eggs and the ribbon is beautiful! I never thought a glass wreath could look so good. I love this, just have to get the supplies! I'm sure I can make this in time for Eadter! Thanks so much for posting this darling idea!!! So cute! What size foam wreath was used? I wouldn't want to run out of yarn! This is adorable! I totally want one now! Hello, I work for Country Living magazine and we would love to feature this craft on our website! Please let us know if we may use one photo in our gallery, with a link back to your tutorial. You can email me at CLIdeas@hearst.com. Love the wreath! Where did you get the eggs? The eggs on the wreath came from Michael's. What size is this wreath form please? I am trying to make sure I don't run out of yarn!